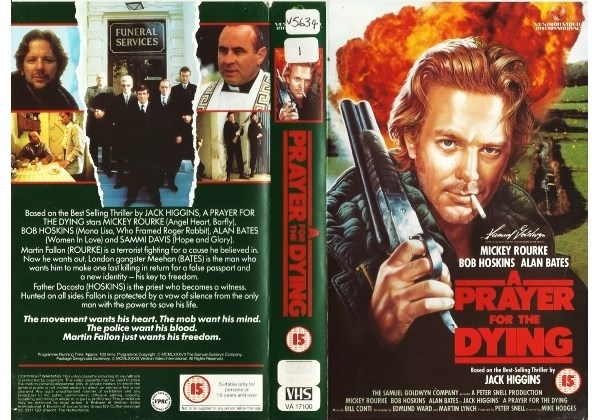 Based on the Best Selling Thriller by JACK HIGGINS, A PRAYER FOR THE DYING stars MICKEY ROURKE (Angel Heart, Barfly), BOB HOSKINS (Mona Lisa, Who Framed Roger Rabbit), Alan Bates (Women in Love) and SAMMI DAVIS (Hope & Glory). Martin Fallon (ROURKE) is a terrorist fighting for a cause he believed in. Now he wants out. London gangster Meehan (BATES) is the man who wants him to make one last killimg in return for a false passport and a new identity - his key to freedom. Father DaCosta (Hoskins) is the priest who becomes a witness.Hunted on all sides Fallon is protected by a vow of silence from the only man with the power to save his life. The movement wants his heart. The mob want his mind. The police want his blood. Martin Fallon wants his freedom. Or find "Prayer for the Dying, A" on VHS and DVD / BluRay at Amazon.